A Hawaii cruise is one of the best ways to see all the main Hawaiian Islands. Norwegian Cruise Line’s Pride of America sails the paradise of Hawaii year round. Because this is the only U.S flagged ship, it is allowed to sail between the Hawaiian Islands without an international stop. There are many advantages and reasons why a cruise to Hawaii makes sense. Port Time: When compared to other 7-day cruises, a Hawaii cruise on Norwegian Cruise Line almost doubles the time in port. On this itinerary you’ll spend nearly $100 in port compared to $25-$35 on a typical 7-day cruise. You spend 2 full days including an overnight on Maui, 1 ½ days including an overnight stop in Kauai, plus stops in Hilo and Kona on the Big Island. Vacation Packing: Because the ship is your transportation around the islands there is no need to pack and unpack for each island you visit. A Hawaii cruise makes seeing the islands easy. Scenic Cruising: a Hawaii cruise includes 2 unique scenic cruises. The Napali Cost of Kauai is one of the most visually spectacular sights of cliffs, waterfalls and secluded beaches. If you’re lucky you’ll also see brilliant rainbows. 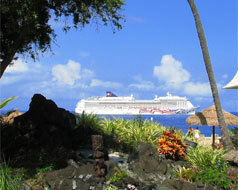 Year Round Cruises: We are always asked – When is the best time to travel to Hawaii? Our answer is anytime between January 1st and December 31st. Hawaii is a fabulous destination year round. Because the cruise goes year round there is always a Hawaii cruise option for you. Port of Departure: A Hawaii cruise on Norwegian Cruise Line begins and ends in Honolulu/Oahu. Why not stay a few days before or after the cruise and take in all that Oahu has to offer. On Oahu you can visit the main attractions of Pearl Harbor, Polynesian Cultural Center and Waikiki Beach. Plus there is a myriad of other interesting things to do including the Aloha Stadium Flea Market, Dole Pineapple Plantation, Hunuama Bay Snorkeling and Kualoa Ranch where many movies have been filmed. The Cruise Experience: Norwegian Cruise Line is known for Freestyle cruising. Freestyle cruising means you dine when, where and with whom you want. The Pride of America has 14 dining options (7 of which are included restaurants), 10 bars and lounges plus high quality entertainment and evening shows. The ship also offers spa services and a variety of activities onboard. In summary, a Hawaii cruise is worth a look. You’ll get a great Hawaiian vacation with Norwegian Cruise Line’s unique ships and itineraries. Portions of the travel mentioned here may have been provided at a reduced rate or complimentary by travel suppliers. Photos are taken in person or provided by the supplier except where credited.